Group Visits at WWT Welney Wetland Centre01353 860711work Group VisitsWWT Welney is a winter haven for thousands of migratory swans and ducks. In summer enjoy tranquil wildlife walks and new dragonfly pond area. Year-round events and activities for all. Eco-friendly visitor centre with cafe, gift shop and discover area to explore. See website for special group-only evening swan feed experiences. Group sizes - min 12, max 60, coach parking on site, driver / organiser incentives, pre-booking essential, guided group tours, conference facilities, shop, full catering facilities. Accessibility - lifts in visitor centre; ramps on reserve to some hides; small areas of reserve inaccessible to wheelchair users. WWT Welney is a winter haven for thousands of migratory swans and ducks. In summer enjoy tranquil wildlife walks and new dragonfly pond area. Year-round events and activities for all. Eco-friendly visitor centre with cafe, gift shop and discover area to explore. 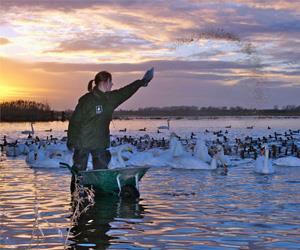 See website for special group-only evening swan feed experiences. March - October: 9.30am - 5pm; November - February: Mon - Wed 10am - 5pm, Thu - Sun 10am - 8pm. Closed Christmas Day.